I am building the next generation of Data Warehousing for a client and because the cloud’s sky is the limit it doesn’t mean they can afford to spend. Millions (25 million) of records need to be analyzed to produce meaningful reports and dashboard. Cranking the power all the way up gives us the information we need in seconds. The highest database tier offered is something call P11. But what behind P11? Did I say this PaaS option was expensive? First, it is not readily translatable into regular machines as the various tiers use a mix of computing, memory and disk IOPS and as per Microsoft: “a blended measure of CPU, memory, and data I/O and transaction log I/O…”. This blend unit is the Database Transaction Unit aka DTU. Notice that this is a comparable size…and that P11 DTU is about CAD$15,000/month!!! And while PaaS is great, the price tag is a little too much for the common mortals getting into DWH. This one, because it is closer to the size I need. P20 disk is 512 GB, it can achieves 2300 IOPS and up to 150 MB/s. The key thing* to understand is that the VM tier will limit the IOPS of what you connect to it. And so here, while my disk is rated at 2300 IOPS and 150 MB/s, the machine specifications are going to limit me at 16,000 IOPS (no problem here) / but only 128 MB/s which is ok because P20 is only 150 MB/s anyway. How to attach faster disks to my VMs then? What if I want to create a VHD with 600 GB and 400 MB/s of throughput? You will not obtain such throughput if you just create a 600 GB VHD, because Azure will create a 600 GB VHD on a P30 Disk, and then you will have only 200 MB/s. Create 3 VHDs with 200 GB each. Azure will create them using P20 disks. Then you use your stripping tool (Storage spaces) to create a 600 GB volume. This volume will permit 450 MB/s (150 MB/s *3) and 6900 IOPS (2300 IOPS *3). Wait, I need more! What if I want to create a VHD with 600 GB and 600 MB/s of throughput? Unfortunately, we can’t just dream, and ask Azure to do it, not till today. In fact, the maximum throughput possible is 512 MB/s, we can’t do better. Ok. You have created the stripped volumes and you are still not getting what you want? Remember the key thing I mentioned above * ? The total data storage, the IOPS and the throughput are limited by the VM series and size. Each Azure Virtual Machine type is limited by a number of disks (total storage size), a maximum IOPS (IOPS) and a maximum throughput (Throughput). For example, you may achieve a 128 MB/s only in a Standard_E8s_v3. All the other VM types will throttle your IOPS or throughput when you reach the threshold. When I was looking at the Memory optimized server size, there are Storage optimized VM sizes. And so from the disk creation steps above, you will also want to get a VM that will be able to provide you with the throughput you need. There was once a customer who was on Exchange 2013 on-prem for their email needs, at some point they decided (thanks to Microsoft enticing pricing) to go with Office 365 and migrate all of their mailboxes and email needs to the cloud. And so, while moving to Office 365, all of the DNS entries (internal and external) for autodiscover had been changed to autodiscover.outlook.com but the old one: autodiscover.contoso.com – in theory, the on-prem exchange server CAS – would still be around and generate the message. So where would this on-prem reference come from? 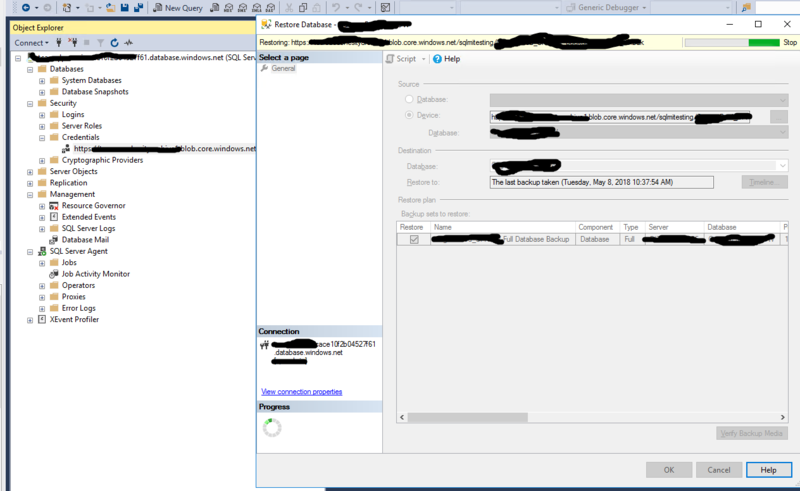 While on-prem, Exchange would have been configured to add entries to Active Directory and here in the name of a Service Connection Point (SCP) object and as the domain joined machine want to auto-configure Outlook, they would end up finding of that older reference. The preferred way is to use the Exchange Management Shell to clear the entry for the Client Access server from the SCP. This object to remove has the Class type serviceConnectionPoint. WARNING: You must restart this server to finish the installation process. However the other day, I wanted to create a new application and got the following “unknown” error. The SMS Provider reported an error connecting to the ConfigMgr site database server. Verify that the SQL Server is online and that ConfigMgr site server computer account is an administrator on the ConfigMgr site database server. SmsAdminUI.log would something unknown as well. Scratched my head a few times and started DDGing as the error was pretty self explanatory and found the following KB/Blog entry. Basically, after such a DB files location move the SQL TRUSTWORTHY setting gets reset and the dbowner may change. I hope on the MSSQL and executed the following queries to save the day – well only the creation of new packages. This document describes how to uninstall GP2010 and installation of GP2015. Install GP2015 (includes dexterity 14) as usual. note that Mekorma not playing nice with wmic or msiexec – must uninstall manually. Because of my recent work with ADFS I was looking for a way to automate most of the certificate configuration by scripts. The usual run-books I write would usually include the use of the mmc and a bunch of screenshot to accompany them.